Anthony Geist, professor and former chair of the University of Washington’s Department of Spanish and Portuguese Studies, has been awarded one of Spain’s highest civil honors. In a ceremony April 16 in Brechemin Auditorium on the UW campus, Geist was admitted into the Order of Isabella the Catholic with his nomination to the first-class title of Caballeros de la Gran Cruz de Oficial, or Knights of the Officer’s Cross. The honor is conferred on those who have given exceptional service to the benefit of Spain. 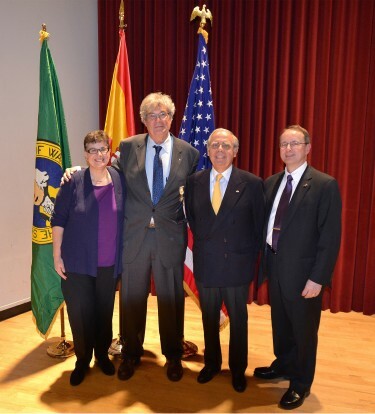 The award was bestowed on Geist by Spain’s Honorary Consul in Washington state, Luis Fernando Esteban, and the event included a concert by Grammy Award-winning pianist Chano Dominguez. Geist said his “enduring love affair” with Spain began with his first visit there as a junior from the University of California, Santa Barbara. Since then, he has devoted his professional life to studying and teaching the language, literature, history and culture of Spain. He has published a dozen books, including “La poética de la Generación del 27 y las Revistas Literarias” (1980), “Cartografía Poética” (2004) and “El Canon Abierto” (2015), as well as roughly 100 articles. His other work includes a 2002 traveling exhibition and book, “They Still Draw Pictures: Children’s Drawings from the Spanish Civil War to Kosovo,” and a 2001 photo essay and 2006 documentary about the Abraham Lincoln Brigade, as well as its first as its first public monument in the U.S., on the UW campus, in 1998. In 2015 he curated an exhibit of the Basque exile painter Miguel Marina. Geist also established and is executive director of the UW’s Study Center in León, Spain, which has hosted programs from 15 departments or units involving more than 600 students. Read a 2014 profile of Geist at the Spanish and Portuguese studies website.